Secret lovers? (From Wireimage) Those rumors of romance between rapper Kanye West and Kim Kardashian are back for another round, as the New York Daily News reports that the two seemed very into one another at an after-party for Jay-Z and West's "Watch the Throne" concert in Beverly Hills. We'd like to point out that maybe they're not so much into each other as much as all the attention they'd get if they did in fact hook up. Also in music news, Miley Cyrus and Kelly Osbourne team up against cyber-bullying, Courtney Love is facing eviction, and Lady Gaga, Taylor Swift, and Katy Perry are extremely wealthy ladies. Girl power! • Kanye West and Kim Kardashian have tongues wagging again, this time because "Kanye was eating Kim up like she was piece of cake" at a "Watch the Throne" after-party on Tuesday night. Ew. West was spotted caressing the famous reality star's hair extensions, with one spy noting, "I think he was dying to kiss her, but there were too many people in the room." Also: "He wouldn't talk to anybody else," and attendees suspected they might have left the party together. On the surface, it might seem like Kanye and Kim are a match made in tabloid heaven. They're both obsessed with themselves, for one. But Kanye doesn't strike us as the type of guy who could handle being with someone who gets more attention than he does. And Kim would have to deal with a lot of fur and jewelry envy with this one. So if these two did get together and filmed their own hip-hop version of Newlyweds, it would probably be the best and worst thing to ever happen to television. Let's hope that these latest rumors lead to the leak of the rest of Kim's music video for "Jam (Turn it Up)," which featured a cameo by the one and only West. Miley Cyrus: Hates online bullies, but not real-life ones. (PCN) • Miley Cyrus came to her pal Kelly Osbourne's defense this week after a user named @Drealaloca sent some offensive tweets to Osbourne and her mom, Sharon. Miley rounded up her tween troops by writing, "I'm so sorry @mrsosbourne and @MissKellyO for the abusive tweet from @Drealaloca I don't think it's right for people to use twitter to abuse and harass others. Just cause your hidden behind some computer like a coward doesn't mean this isn't bullying." Osbourne followed up, "I can't thank all of you enough for your support in stopping #CyberBullying it's truly heart warming!!! I love all my twitter friends!" It's not clear what the user in question actually said to Kelly, but her indignation is pretty ichh considering she's practically made a living out of calling Christina Aguilera fat. • Courtney Love lives in some sort of alternate reality where it's reasonable to rent a New York City apartment for $27,000 a month when your financial struggles are common knowledge. And unsurprisingly, Love now faces an eviction, as she reportedly owes over $50,000 in rent. What's more, she's angered her landlords by messing up the fancy pants interior design. Owner Donna Lyon called up Page Six to complain, noting, "I came to New York to see it and I was horrified by what she had done. The walls that had been hand-painted and glazed were ruined, covered in damask wallpaper and ice-blue paint." Lady Gaga: Rolling in it. (PCN) • Lady Gaga is the top-earning woman in music, having pulled in about $90 million in the past year. But since half her paycheck goes to daddy, she actually earned about as much as the next biggest earner, Taylor Swift, who earned about $45 million. Katy Perry rounded out the ridiculously well-paid pack, taking in $44 million. Beyonce and Rihanna earned $35 million and $29 million, respectively. • Justin Bieber was being his typical Mr. Cool Dude self in Beverly Hills yesterday, despite narrowly escaping a ticket in his Batmobile hours earlier. Singer Justin Bieber is pictured leaving Spago Restaurant and later returning to his hotel in Beverly Hills, CA. • Katy Perry slipped into a demure little retro dress to promote her new fragrance Meow at The Grove. We're loving her new look! Katy Perry boards the tram at The Grove to to promote her new fragrance 'Meow!'. • Jennifer Lopez was in Pasadena on Wednesday to tape American Idol auditions, looking very much the diva behind cat-eye sunglasses. And no: She did not arrive in a Fiat. Jennifer Lopez arrives at the "American Idol" auditions in Pasadena. • Demi Lovato is a bright new shade of raspberry. We like the color, but she kinda looks like Ariel under all those hair extensions. 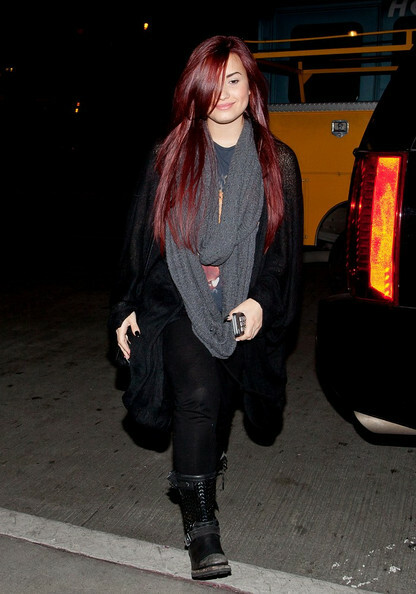 Demi Lovato jets out of LAX (Los Angeles International Airport) on a late night flight.